Since the release of the first Star Wars movie nearly 40 years ago, the Star Wars saga has had a seismic impact on both cinema and culture, inspiring audiences around the world with its mythic storytelling, captivating characters, groundbreaking special effects, and iconic musical scores composed by Williams. 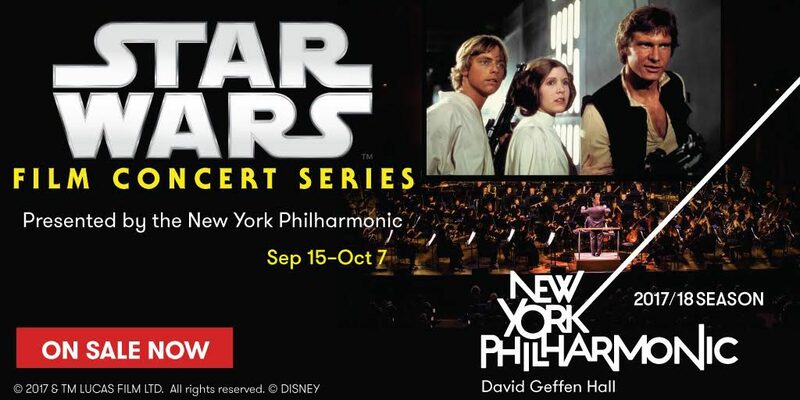 Fans will be able to experience the scope and grandeur of these beloved Star Wars films in a live symphonic concert experience, as the Star Wars Film Concert Series premieres from September 15 through October 7 at David Geffen Hall in New York City. Legendary composer Williams is well known for scoring all seven of the Star Wars saga films, beginning with 1977’s A New Hope, for which he earned an Academy Award for Best Original Score. His scores for The Empire Strikes Back, Return of the Jedi, and The Force Awakens each were nominated for Oscars for Best Original Score. Don’t miss this is your chance to watch A New Hope, The Empire Strikes Back, Return of the Jedi and The Force Awakens on the big screen, accompanied by live orchestra; those of us lucky enough to have seen The Lord of the Rings film concerts know how special such occasions are. Tickets are on sale to the general public TODAY – you can purchase them online here or by calling (212) 875-5656! Follow @NewYorkPhilharmonic on twitter. Click here for details of dates and times, and to buy tickets. Due to the holidays, we’ll be continuing our stories related to the 15-year anniversary of the release of FOTR into this week. 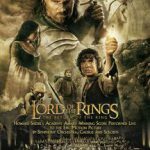 No series about The Fellowship of the Ring would be complete without mentioning the amazing music of Howard Shore and some of the talented people who brought it to life. From the minute the screen lit up to the end of the credits, Shore’s Oscar-winning score held us spellbound. As the music accompanied the action of the movie, unique themes for the cultures of Middle-earth, even The One Ring itself, wove themselves through the movie seamlessly. Haunting solos and full-voiced choirs added both poignancy and excitement to the film. If you’re like me, you literally wore out your first CD of the score! Fortunately, there were a number of opportunities to acquire other editions such as The Lord of the Rings: Fellowship of the Ring Complete Recordings. 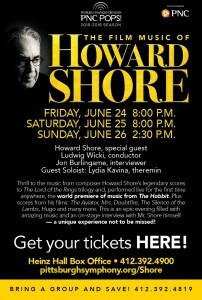 Our friend, Doug Adams, recently confirmed via twitter that the Pittsburgh Symphony Orchestra’s program later this month, The Film Music of Howard Shore, will include the premiere of The Hobbit: Four Movements Ra. This has been long awaited by fans as a logical progression from Shore’s The Lord of the Rings Symphony, released on CD in September 2011. No word yet on if and when it might be available on CD, but if you’re in or near the Pittsburgh area at the end of this month, the performances are scheduled for Friday, June 24 and Saturday, 25 at 8:00 p.m. with an afternoon concert scheduled for Sunday, June 26. 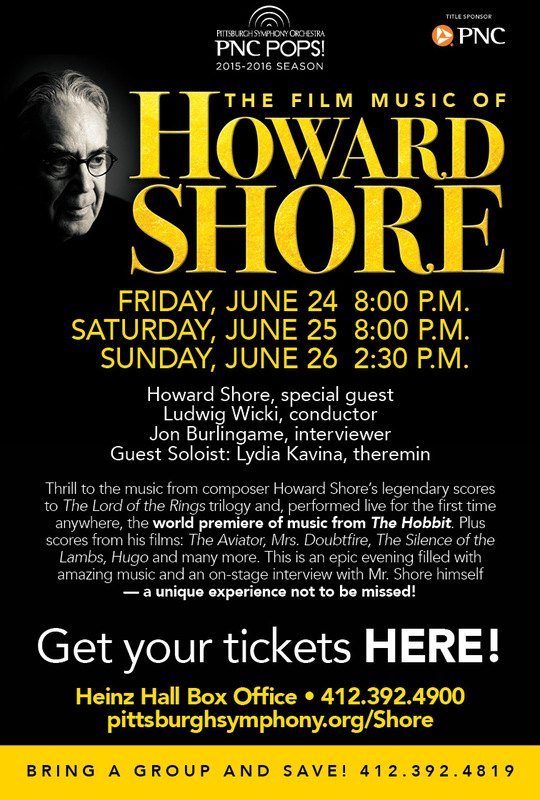 In addition to music from The Hobbit and The Lord of the Rings, the performances will also include music from other Howard Shore scores such as The Aviator, Hugo and The Silence of the Lambs, and more. Get more information and purchase tickets here, on the Pittsburgh Symphony Orchestra’s website. Update: thanks to Doug, we can now share the official press release for the event! Check it out below, and be sure to purchase your tickets soon if you’re lucky enough to be able to go. Also, don’t forget to send us your reports and pictures from the concert! 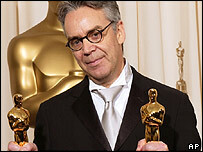 Pittsburgh Symphony Orchestra concludes another spectacular Pops season with a one of a kind evening: an audience with the Academy Award-winning composer Howard Shore. The Pittsburgh Symphony Orchestra celebrates the outstanding career and achievements of a true icon, with performances of his best known scores and live interviews, by acclaimed film music writer Jon Burlingame, with the composer from the stage. Audiences will thrill to the music from his legendary scores to The Lord of the Rings trilogy and the world premiere of music from The Hobbit with scores from his films: The Aviator, Mrs. Doubtfire, The Silence of the Lambs, Hugo and many more. This is an epic evening filled with amazing music and the composer’s own insights. A unique experience not to be missed! As you know, last week a select group of fans in London were treated to a screening of The Hobbit: The Battle of the Five Armies Extended Edition. Some pretty special guests were in attendance – we hope many of you were able to watch via the live stream! “On Saturday, 7th November 2015, a number of the world’s biggest and most passionate fans of The Hobbit film trilogy assembled in London for a very special screening event, where they were joined by a host of special guests, to celebrate the release of The Hobbit: The Battle of the Five Armies – Extended Edition on Blu-Ray, DVD and Digital release, and to commemorate the one-year anniversary of last year’s incredible The Hobbit Fan Fellowship Contest competition. The Warner Bros. Home Entertainment release is the final film in the globally popular The Hobbit Trilogy, a production of New Line Cinema and Metro-Goldwyn-Mayer Pictures. Kyle Pedley of (A)musings Media, who was among the UK-based winners of the global fan competition, organised and hosted the event along with fellow members of The Hobbit Fan Fellowship, with help from Warner Bros. Pictures UK and Tourism New Zealand. International winners flew in from all over the globe – from as far afield as the United States, Mexico and Eastern Europe – to take part in an evening full of surprises and special appearances. Guests were not only treated to an exclusive UK screening of the Extended Edition of The Hobbit Trilogy’s epic conclusion at Warner Bros. Pictures’ own private screening theatre ahead of its home entertainment release, but were also treated to surprises including a video message from director Sir Peter Jackson all the way from New Zealand, and a Q&A session with a panel of distinguished guests. These included Royd Tolkien, great-grandson of author J.R.R. Tolkien and long-time advocate and supporter of the film adaptations (who made a cameo appearance in 2003’s The Lord of the Rings: The Return of the King), and writer / broadcaster Brian Sibley, who has long been involved in the community celebrating the author’s legacy, having been jointly responsible for the acclaimed 1981 BBC Radio adaptation of The Lord of the Rings and penning a number of official behind-the-scenes books and guides for both of Peter Jackson’s Middle-earth trilogies. Finally, to the excitement and disbelief of fans – met with an uproarious standing ovation – came the surprise appearance of film, theatre and television icon Sir Ian McKellen, known and beloved around the world for his defining portrayal of the Wizard Gandalf in Jackson’s Middle-earth and the only principle cast member to appear in all six films across both celebrated film trilogies. Other special guests in attendance included a contingent of Middle-earth ‘cosplayers’ – The Galactic Knights, who showcased some of their terrific Hobbit- and Rings-inspired costumes and replicas; Chairman of The Tolkien Society, Shaun Gunner; and Rachel Sprackett of Tourism New Zealand. 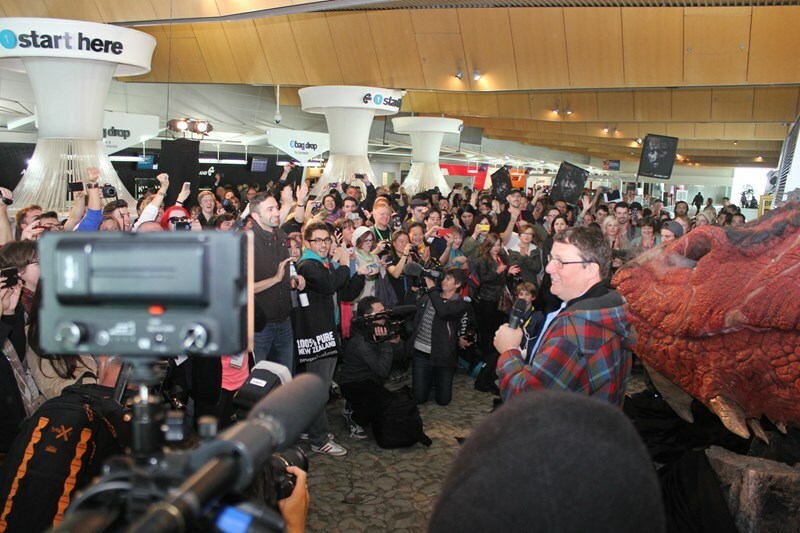 The Hobbit Fan Fellowship Contest was an international search conducted in 2014 by Tourism New Zealand, Air New Zealand and Warner Bros. to find 75 of the world’s biggest Hobbit fans. Over 140,000 people registered for the competition, and over a two month period were required to complete a series of tasks and challenges, including testing their knowledge of New Zealand as the cinematic Middle-earth, designing a postcard for Peter Jackson, and also producing their own two-minute videos detailing their favourite memories of Middle-earth and demonstrating why they were the biggest fans of the franchise. 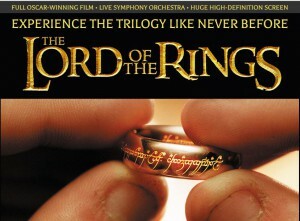 The Lord of the Rings in Concert – a taste! We hope that everyone who is there is having a great time in the Big Apple! Mathematics aficionados have had fun this year with the once-in-a-lifetime PI Day — 3.14.15. 9:26:53. Symphony Silicon Valley has more numbers for the inner geek in all of us. Last week we posted about the Live Orchestra performance of the LOTR trilogy, we can now provide you with the full details for this special event, grab your tickets fast! A couple months ago we announced the big LOTR trilogy screening announcement for the Lincoln Center in NY where a full symphony and choir accompanies each film in a live, soundtrack performance. Having seen the first two, this is a ‘not to be missed’ event, unless you were denied tickets when the ROTK sold out. Well, never fear, the Symphony Silicon Valley has picked up the quest and will be running two cycles of the trilogy in San Jose in mid-April. Run, do not walk and get yourself your tickets for this amazing performance of the much loved set of films and musical scores. You can read all the details HERE. For the first time in North America, the complete film trilogy The Lord of the Rings will be presented live, in concert, at the David H. Koch Theater at Lincoln Center, New York, April 8-12, 2015. 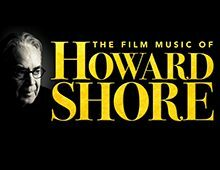 Beneath a giant screen, the Academy Award-winning scores by Howard Shore will be performed by 250 musicians, on stage, including symphony orchestra, chorus and soloists, in two trilogies, Wednesday-Friday, April 8-10, and Saturday-Sunday, April 11-12. 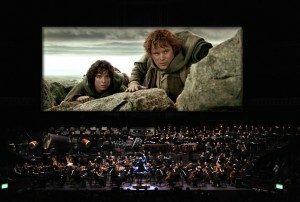 The production is created by CAMI Music, and follows acclaimed concert presentations of the first two films of The Lord of the Rings trilogy at Radio City Music Hall (2009 and 2010). 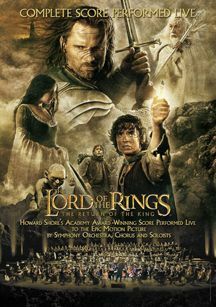 The Lord of the Rings, In Concert, at Lincoln Center, features the 21st Century Symphony Orchestra & Chorus of Lucerne, Switzerland, conducted by Ludwig Wicki, which specializes in bringing films and their scores to life, and performs an annual program of film concerts at the KKL Luzern. Soloists and chorus for the 2015 trilogy performances at Lincoln Center, as well as related forums and other events, will be announced at a later date. As contests go, this is one for the ages. And it should be, since it heralds the beginning of the end of the final installment of Middle-earth movies at the hands of Peter Jackson and his movie-making team. It’s also the final cinematic trumpet blast from the director’s home country of New Zealand that has stood in as a real-world wonder for the fictional world of author J.R.R. Tolkien. Fans from around the world will have a chance to win a trip to see New Zealand in all its glory if they win the trip that will take them eventually to Wellington to watch the first screening of “The Hobbit: The Battle of The Five Armies,” with its director. Along the way they will stop at iconic locations the length of the island nation that helped create the cinematic Middle-earth. No doubt that will include a stop to the Hobbiton Movie Set on the farm where more than a decade ago, the literary village and home of Frodo Baggins left the imagination and books to became tangible as it was constructed for Jackson’s LOTR trilogy. Many websites will help host the contest and TheOneRing.net will sponsor the portion of the contest that is for “the rest of the world.” Read on for details! Entering the contest is a multi-step process (and this is not a replacement for the rules) but each entrant will need a Twitter or Facebook account to get things started. Then four challenges will be presented by each contest sponsor website but the primary judging is to be based on a video participants are asked to submit (two minutes or less). If you want to participate, we urge you to read the rules completely and to comply. Through TheOneRing.net, you can enter if you aren’t from one of the following nations: Australia, Belgium, Brazil, Canada, Chile, Finland, France, Germany, Hong Kong, Italy, Japan, Korea, Mainland China, Mexico, the Netherlands, New Zealand, Norway, Republic of Ireland, Singapore, Spain, Thailand, United Kingdom (including Channel Islands & Isle of Man), United States and any country to or on which the United States has embargoed goods or imposed targeted sanctions, such as Cuba. So readers in Austria, Greece, Romania and the like (just picking off the top of the writer’s head), welcome to the show. For the readers from the nations listed above, your portal to the contest will be elsewhere. For example, those in the United States can go right here. If you do enter from a nation that isn’t yours, you aren’t eligible so we recommend not trying it. Those wishing to enter TORn’s portal and are from the correct nation need only click RIGHT HERE! Since it was first announced at Comic-Con International in San Diego on 27 July 2014, upwards of 25,000 people have already registered their interest to participate. We at TORn expect that number to be obliterated quickly. 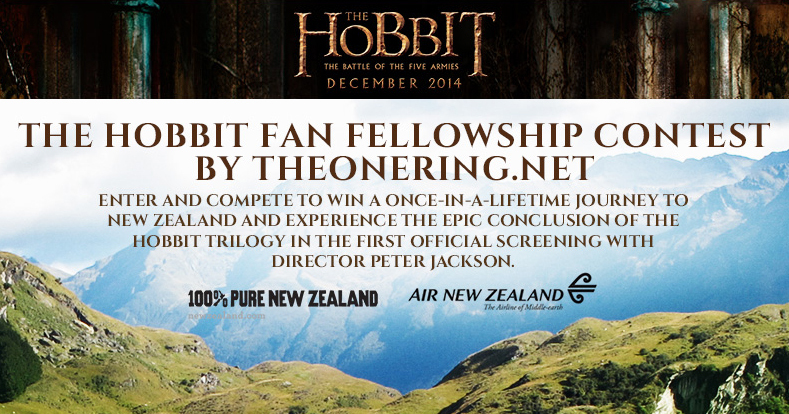 The Hobbit Fan Fellowship will also visit other key film sites throughout New Zealand’s Middle-earth chosen by Sir Peter Jackson and end in Wellington for the ultimate film fan’s dream – a private screening of the final film, “The Hobbit: The Battle of the Five Armies,” with Sir Peter Jackson. Directed by Peter Jackson, The Hobbit: The Battle of the Five Armies features a screenplay by Fran Walsh & Philippa Boyens & Peter Jackson & Guillermo del Toro, based on the novel by J.R.R. Tolkien. Jackson also produced the film, together with Carolynne Cunningham, Zane Weiner and Fran Walsh. The executive producers are Alan Horn, Toby Emmerich, Ken Kamins and Carolyn Blackwood, with Philippa Boyens and Eileen Moran serving as co-producers. Production took place at Jackson’s own facilities in Miramar, Wellington, and on location around New Zealand. Post production took place at Park Road Post Production in Wellington. Posted in Contests, Director news, Events, Fan Fellowship Contest, Fans, Hobbit Movie, Locations Sets, Peter Jackson, Premieres, Studios, The Hobbit, The Hobbit: The Battle of the Five Armies, Warner Bros.